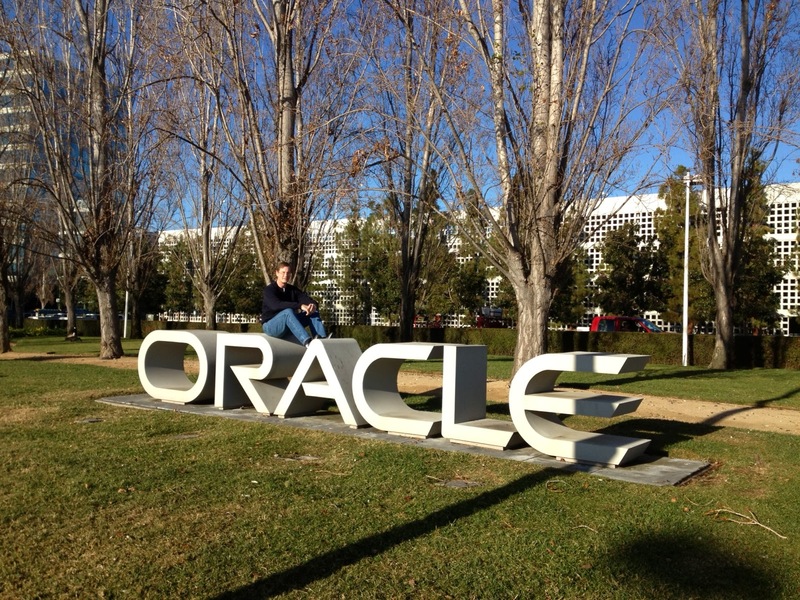 What better way to start the new year than with a tour of Silicon Valley? Every good geek should do a pilgrimage here at least once in his hacking career. I've been lucky enough to work here and be in the area a number of times. But I'm usually too busy meeting with clients to actually play the tourist. Also, the technology firms and startups aren't geared toward tourists -- most of the sites will only be markers in the ground, or, if you're lucky, a small museum and gift-shop in the lobby. To assist the busy Hacker, I've developed this itinerary, which TheHackerCIO has now tested and proven that it can be done in one day. You can probably fit a few extras in, but it's better to spend that time at the museum. Or at Stanford University. A. 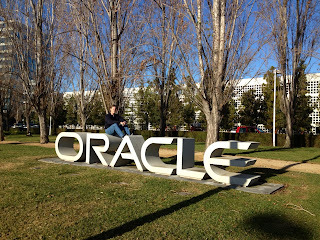 We start, appropriately, for a long-time DBA, with the back-end, namely the Oracle headquarters. B. Then we move on to the Facebook Headquarters at 1 HackerWay. You should be aware that this used to be the old Sun building, and they preserved the sign on the back of this one! 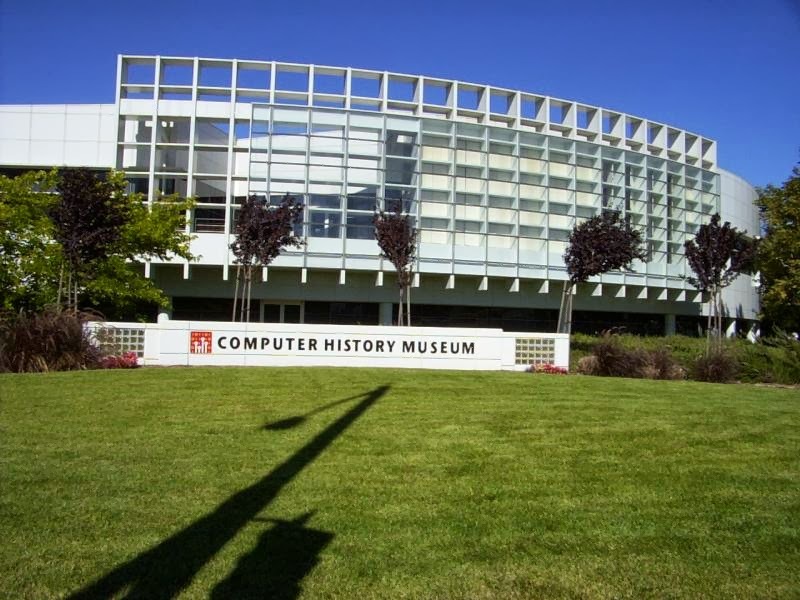 C. The ultimate iconic startup garage is a must-gawk, where Bill Hewlett and Dave Packard started HP. You can read about the restoration effort here. Off to the right is the shed where Bill slept, while they were producing their first product, an audio oscillator, which was ordered by Disney for use on Fantasia. Everyone has their own candidate for "birthplace of Silicon Valley," and this HP shed is definitely on the short list. Then you should head into Stanford University, and at least take a drive around the campus, if not spend a whole day there, as I did, the day before I tested this tour. D. After that, head down to Sand Hill Road, the Venture Capital life-blood of Silicon Valley. I counted at least 25 VCs in just this one complex! E. Nearby, Xerox Parc Place is nestled, where the whole notion of a mouse and GUI was invented along with the Smalltalk and, thus, Object Oriented languages! F. Then, on to the site of the Shockley Laboratories, where production of the first transistors began. The site is marked by this signpost, which considers it the Birthplace of Silicon Valley. G. Unfortunately, all that remains is a signpost indicating this historic location. Likewise, the first breakaway company, Fairchild Semiconductors, where the "Traitorous Eight" -- defectors from Shockley's company -- led the first commercially successful semiconductor firm. Likewise, all that remains today is a plaque. This is candidate #3 for "Birthplace"! I. Onward to the Googleplex. We've spent a lot of time in the car, so it might be good to get some exercise. If you're lucky, like TheHackerCIO, you might find a spare bicycle to take for a spin. No tour or museum here, unfortunately. Plus, with the protesters who envy the money made by Google employees, the security is only likely to increase. J. Y-Combinator is the accelerator of Paul Graham. It's the gold standard for new, lean startups. You might not get a huge funding round here, as you would from the VCs, but you're going to get far better than an MBA from the advisors he'll put you in with! L. Intel has a nice little museum about the development of the chip and it's miniaturization through the years. M. Ebay seems almost like a mainstream institution these days. N. Apple has an infinite loop around their main campus. But this one leads to practical parking, not to a hung system. Put "Hackathon" on your New Year's Resolutions!